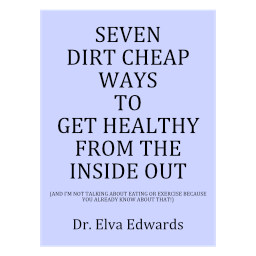 June 2016 – Dr. Elva Edwards, D.C.
My patient looked up at me and said, “I followed the wise words spoken by Dr. Elva Edwards.” I had to ask, “What did I say?” He recalled a day in my office some years ago when he told me he didn’t have health insurance. I suggested getting insurance would be a good idea. But, he protested, “He doesn’t like medicine and they don’t have anything to offer him.” I said, “Use them for what they are good for.” We have to admit, medicine is very good at doing what they do well. But the complaint I receive the most is: “They just want to give me medicine,” My response is, “That is what they do.” My patients often expect more and are disappointed. Medicine doesn’t typically offer more natural therapies. But we don’t need to throw the baby out with the bathwater. Use them for what they are good for!! My patient is glad he did get insurance as a few health problems have emerged. In my opinion, every specialty has a place at the table of health care. If they didn’t help us in the way we wanted to be helped, we probably went to the wrong kind of provider. Our toes are so important for balance as well as for walking. The toes can take a beating with ballet, soccer and other sports, even hiking. As we get older, toes get bunions, crooked toes, rigid toes, toes that are too long or not long enough. I have a good size bunion on my right foot. One day my sister said, “When are you going to get that thing fixed?” I said, “Hopefully never,” because my bunion doesn’t hurt. I would never have surgery unless I was in extreme pain. Just because it is ugly, isn’t enough reason for me to approve of the knife! If you have a toe problem, there are many more aids today that when I was a child. Next time you are in Walgreens, stop by the foot and toe section and see all the wraps and tapes and products to make you more comfortable. Our toes are very small but play a large role in balance and coordination. Mother’s Day passed and Father’s Day is upon us. No two people are more important to us in our development than our parents, whether they are good parents or not. These holidays are for celebrating the best the parents had to offer us. Whether our experience was positive or negative, we have learned many lessons from them. This is a great time, if you are a parent, to make a few goals for the coming year. Do you know how much your child, no matter what age, would appreciate a few comments from you regarding what you love and appreciate about them? As we know, it is sometimes hard to take suggestions from parents, but it isn’t hard at all to hear how much they love us or what they appreciate about us. So whether it is, “you have such style in your dress,” or “I love the way you parent your child,” or “you have such a kind heart,” or “I really admire your business savvy,” or a million other remarks. Leave your child with the positive memories of your admiration! Just call me Ann Landers! !